We offer in-stock and custom-built hi-end audio products with the highest flexiblity, ultimate musicality, and dynamic airy sound stage, with 'No-frills' direct from the factory pricing you may have never dreamt of !! Along with excellent customer support and service. All products 100% professionally hand-made in Canada. Since 1996, Space-Tech Lab. 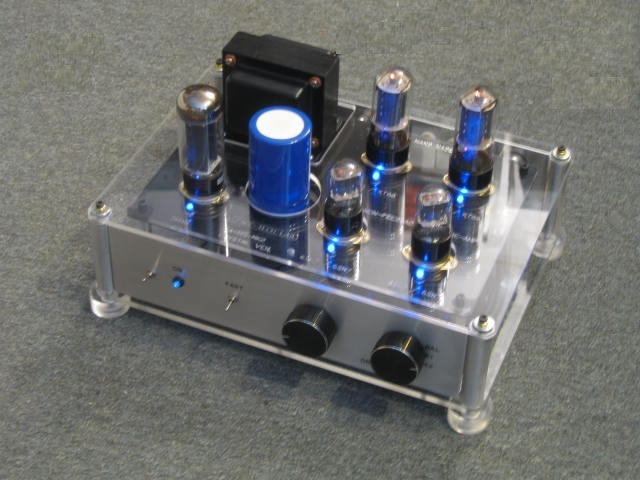 has been dedicated to creating custom designed, ultra-audiophile quality tube audio equipment at factory-direct prices. Our full 3D holographic sound stage produces a natural, ORGANIC, rich sound with high density and silky details, addictive tonal quality and airy openness. Our quality amps, pre-amps, speakers and other equipment are available at a fraction of the cost of mass-market competitors, while still easily surpassing their sound quality. We design, build and distribute from our site in New Westminster, Canada. By eliminating all the middlemen, including expensive advertising, sponsored reviews and marketing campaigns, we are able to provide you with equipment and services at a factory-direct cost without wasting your hard-earned money. Even so, we are not here to provide average quality audio products, instead we are specialize in making extremely hi-end sound products, with an unbelievably reasonable and affordable price, by stripping out those expensive marketing acts and make-up which do nothing good to the actual sound quality. After moving to our New Westminster location, we now have a much bigger space for R&D and improved production equipment. With our 40+ years of engineering background in design and manufacturing of super high-end audio equipment, along with the trained perception of musicians, we have developed many break-through technologies. These break-through technologies are continuously incorporated into our new products. As a result, the sound quality of our products easily surpass those big names in the industry, with a huge performance gap as well. Our evolutionary ORGANIC circuit design can make digital signals sound totally like analog. We can extract every last drop of music in the recordings, making the essence surface out effortlessly. You will experience the full array of emotional expressions from the musicians and singers in the most intimate way, making you totally immersed in the truth of the music. Our tube circuits are hand wired point-to-point and component-to-component. With our special NewAge designed circuits, even our entry-level pre-amp QA-001-Mk3, just starting at C$780, is sonically-superior to mass-market pre-amps that sell for US$3,000 to US$5,000. Prospective customers are welcome to order one for trial with 100% satisfaction guaranteed. We also invite you to bring any grade of hi-end audio equipment into our showroom for comparison or system matching. In-person is the best way to experience the sublime performance of our stellar hand-built components. All of our products can be easily combined with your existing equipment since they are designed with superior flexibility. The sonic performance is so good that our customers usually tell us that we have exceeded their expectations while meeting their most critical requirements. All our products are 100% hand-made in Canada by our design engineers and built with very strict considerations for tonal balance, musicality, sound stage, and emotional expression. Our customers, which include many experienced audiophiles and musicians, have given our equipment wide acclaim and acceptance. Our attention to quality and detail means that our products have much better sonic performance than name brand products that cost five to twenty times as much. Thousands of customers tell us they are thrilled with both our quality and our prices. All the prices on our site are actual factory-direct prices for the end user, not highly inflated MSRP or listing prices. Custom designs and consultations are available on request. We treat all our customers with equality and respect, regardless of your level of audio interest and expertise. Your audio enjoyment and ultimate satisfaction is our ongoing commitment, but we reserve the right to the in-depth design secrets of our advanced technology (unauthorized copying or duplication of our designs or circuit is prohibited). We also make our technology and product designs available on a consulting, project or licencsing basis, which can save investors a lot of money and time on R&D, and allow for rapid product launch to the market. Our design speciality range from audiophile equipment to robotics and artificial intelligence. Please contact us for further information. You might be surprised if you found out some designs of those big names originated from us. Of course, you'll have to pay a lot more just to buy their brand-names and logos glorified with shameless marketing hype.